A couple of months ago (Feb 27th blog) I showed the study below. It looks at instances of SPX and VIX both closing positive on a Friday. The VIX has a tendency to move opposite the SPX, so when they move in the same direction, it can often suggest an edge over the next few days. 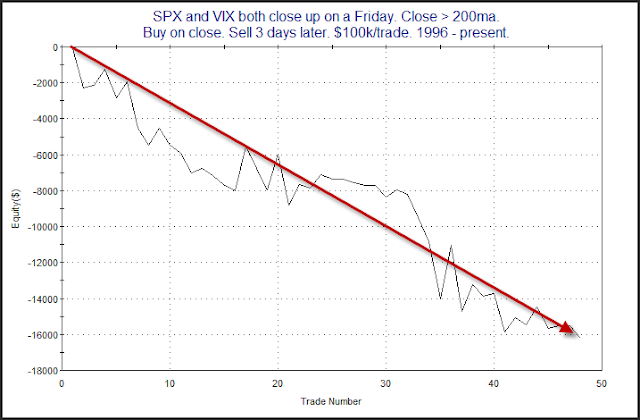 Due to calendar effects the VIX has a natural tendency to sink on Friday afternoons as we approach the weekend. So seeing the SPX and VIX both rise is less common on Fridays than any other day of the week. This is why I use Friday as a filter. Note that I also included a long-term trend filter. And even in an uptrend the numbers here suggest a short-term downside edge. That edge primarily plays out over the first three days. Below is an equity curve showing how the edge has evolved assuming that 3-day holding period. The edge has persisted for some time and the curve is again hitting new lows. This acts as confirmation of the stats table. Strong gaps up on the morning of a Fed Day have typically been followed by more strength that day. Unfilled gaps can be a signal of strength in the direction of the gap. But when they are quickly reversed by a sign of weakness that can suggest the first move was false. Friday's unfilled gap up in SPY was a sign of strength. Monday's unfilled gap down was a sign of weakness. This suggests Friday's move was false. Unfilled gaps down that directly follow unfilled gaps up have historically led to further short-term weakness. This can be seen in the study below. The edge has primarily play out over the next 3 days. Of course with AAPL earnings, Wednesday's Fed Day, and European news flows there are a lot of outside forces that could impact the market over the next few days. But the action over the last 2 days will likely weigh on the market. In last night's Subscriber Letter I showed this study with an additional filter that suggested an even greater downside edge. If you have never trialed Quantifiable Edges before, go here to sign up for a free 1-week trial. You'll be able to see that letter. If it has been more than 9 months since your last trial and you would like another one, simply send an email to: support @ QuantifiableEdges .com (no spaces) with a request and I'll set you up. Two weeks ago I showed how a negative SOX on a day when the NDX is strong can suggest bearish implications for the short-term. Last night Johan, a frequent reader, observed that the reverse had occurred (NDX down over 1% while SOX was up). He wondered what the implications of that might be. It stoked my curiosity as well. So I took a look. Moves higher have strongly outsized moves lower, but the consistency has not been great - just a little over 50/50. So I am not sure I would label this as "bullish", but it provides some hope for the bulls and is certainly better than the alternative we looked at a couple of weeks ago. April expirations week has historically been very bullish. I showed this last year in the 4/11/11 blog post and have updated it below. The consistency has been very impressive. Last year was one of the few that was a loser from start to finish. On March 2 I discussed a setup in which the NYSE TICK manages to trade above 0 for the entire 1st 30 minutes of the trading day. Such a setup used to suggest bullish implications, but that no longer appeared to be the case. I also have an old study that looks at the other side of the coin. 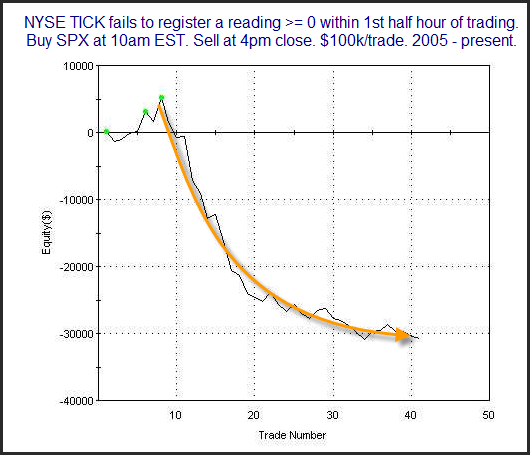 What if TICK goes the 1st 30 minutes and trades BELOW 0 the whole time? This NEARLY triggered this morning. The TICK managed to move up through 0 in the 30th minute. But let's take a look at it anyway. Everything here still suggests bearish implications. An average loss of an "additional" 0.75% between 10ma and 4pm is quite large. But let's take a look at the equity curve to see how the edge has played out over time. While recent instances have not been as powerful as some we saw in the past, the downside still appears to be intact. It may be waning, but it still appears prevalent enough to raise a red flag. Below is a quick look at how the SPX has performed in the past on Holy Thursday. Like the last day before many long weekends, it has shown a bullish propensity over the years. The numbers are compelling, and it is especially impressive to see how much the winners have outsized the losers. One interesting aspect of Monday’s trading was the discrepancy between the NDX and the SOX. While the NDX rose 1.1% on Monday, the SOX declined slightly - which is unusual action. Typically, such action has been followed by weakness in the NDX. This is demonstrated by a study last seen in the 9/9/10 Subscriber Letter, which I have updated below. Six days out 78% of the instances were losers and the average occurrence was nearly a 3% loss. That seems to be a fairly substantial edge. Last year I showed how since 1994 the 1st week in April has been especially good to the SPX. Below I have updated those results to include 2011. As you can see, the statistics here strongly favor the bulls. 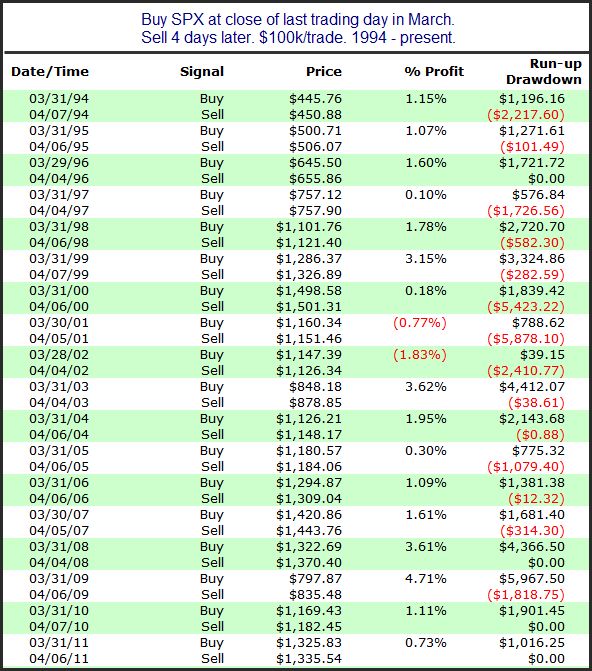 Below is the full list of trades using a 4-day exit strategy. Everything here seems to confirm the bullish tendency.